This is our second home in a beautiful part of the West coast of Ireland. It is in a rural setting so a car is necessary. You will have next door neighbours on either side. When you look out of our windows it is like looking at a picture postcard. Now that the summer holidays are drawing close we would would love to do an exchange for even 3 or 4 days within Ireland, maybe over the South East of the country. Anything will be considered, as they say a change is as good as a rest. We do rent ours occasionally so we would just have to make sure that it is not booked for the dates you might want. We don't have to exchange simultaneously as this is our 2nd home. Our house is a modern, 5 bedroomed detached house (sleeps 8-10) with panoramic views of the sea. Wooden floors throughout, 2 bedrooms en suite, plus 2 seperate bathrooms. To get a real taste of traditional Ireland, with turf fires, traditional music, great Guinness, fantastic scenery and a warm Irish welcome, make sure you head to Belmullet, Co Mayo. Shraigh beach is a 5 minute drive away and you may have the whole beach to yourself with beautiful white sands. Carne Golf Club is 10 miles from the property and the nearest airport is Knock airport. The house is equipped for anyone who has young children, i.e. cot, buggy, high chairs (2), children's toys. Our names are Declan and Penny, we have 3 children, 2 boys and a girl, ages 9, 8 and 6. We also have Ruby our five year old miniature King Charles Spaniel, she is very clean and she has her own little bed to sleep in, she is not allowed on our furniture so that would apply to your home as well. We would ideally love to bring our dog with us, afterall a dog is not just for Christmas. We live in Galway but have a second home in Belmullet, Co Mayo. Penny is the general manager of a newspaper and Declan is a carpenter. The way the construction industry went in Ireland, i.e non existent at the moment, Declan is currently living in England and working there. Penny is originally from Cambridge and moved to Ireland over 19 years ago. 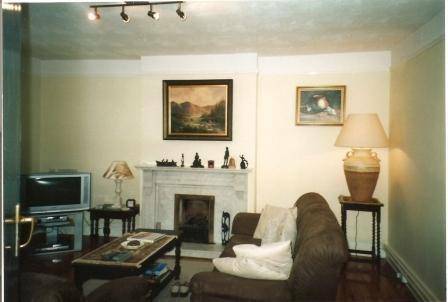 We would ideally like to exchange with a property in Southampton or possibly a few days in Cambridge as we have family there. We would ideally like to exchange during the childrens half term, but we are flexible as this is our 2nd home. Looking forward to hearing from you. The Mullet peninsula is an area of unspoiled natural beauty and mystique, which is becoming a very popular tourist location. Its latest attraction is an 18-hole championship links golf course at Carn, west of Belmullet. The peninsula is about 33 km in length and 12 km wide at the widest points, narrowing to about 400 metres in the region of Elly Bay. The trip from Belmullet to Blackpool point (21 km) gives a good understanding of the nature of the peninsula: its west coast, exposed to the Atlantic, is completely denuded of vegetation, while the east overlooks the inlet of Blacksod Bay. Along the way there is Binghamstown, Elly Bay, with its beautiful beaches, and Aghleam (Eachleim), a popular place for Irish language courses. The ruins of the successor of St. Deirbhile's 6th century church with its Romanesque west doorway, her possible grave, and some early cross-pillars can be seen at Fallmore on the south-west end of the peninsula. To the south-east, there is a splendid view of the cliffs of Achill. Offshore, the uninhabited islands of Duvillaun More, Inishkea North and South (St. Columcille) and Inishglora (St Brendan, the Navigator) contain some very interesting remains of early ecclesiastical settlements including a number of finely incised cross slabs. Inishglora is associated with a celebrated fable in Irish mythology, 'The Children of Lir' (where a group of children were turned into swans and wandered the country for 900 years). the ruin of Cross 'Abbey', a small medieval church the foundation of which is attributed to St. Brendan, the Navigator, in the 6th century, can be seen west of Binghamstown. There is also an interesting early ecclesiastical site at Kilmore. The northern coastline contains the remains of a number of promontory forts. The Mullet peninsula is a popular location for sea-angling. It is also renowned for its unique bird-life, some of which deserve special mention. Termoncarragh Lough, now under the protection of the Irish Wildlife Conservancy, is home to the Red Necked Phalarope (admission to the reserve is by appointment only). The islands of Inishkea are well-known bird sanctuaries. They provide habitats for a large colony of Barnacle Geese (winter visitors to Ireland), and Inishglora is home to a big colony of Storm Petrels. The Mullet peninsula is a Gaeltacht area with a rich heritage of traditional music, song and dance. 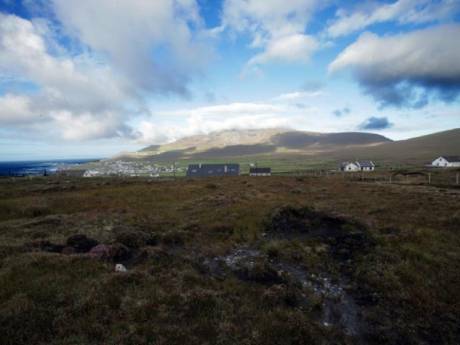 Alt is situated four miles from the town of Belmullet and one and a half miles from the village of Glencastle. This is one of the few remaining traditional rural areas in Ireland. Belmullet town is 4 miles away with shops, pubs, restaurants, supermarkets and bike hire etc. Barnatra is 1.5miles away with supermarket, petrol station and Pub. The latest attraction to the area is the Gateway Leisureplex, and 2 miles from the property, comprising of ten pin bowling lanes, 6 pool tables, kid island (a children's activity centre), air hockey tables, pub and restaurant and birthday party rooms. Log onto www.gatewayplex.ie for further information. Shore fishing is particularly good all round the area. The miles of accessible coastline and almost deserted beaches guarantee the fisherman perfect peace. Sea Angling. With over 40 varieties of fish known to inhabit the waters off the shores of Belmullet, the sea-angler is rewarded with the best all-round sea angling waters in Ireland.The Belmullet Sea Angling Club run a number of open competitions during the year. For golfing enthusiasts Carne Golf Club is a class of its own. It's 18 hole championship links is undoubtedly nature's gift to golf! 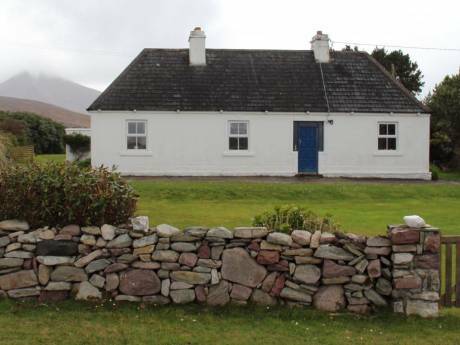 Situated 2.5km from Belmullet town in a very unique and dramatic landscape. It has been rated by 'Golf World (200)' as one of Ireland's top 5 links coursed. Members and non-members are welcome. This you must see, horses racing on a beautiful white sandy beach and clear blue sea as a background. The Doolough Horse racing normally takes places during the Geesala Festival, approximately 15th August. Shraigh Beach is a 5 minute drive from the property, a white sandy beach, blue sea, and possibly only the birds as company, idilic. Check out the photos section for a picture of Shraigh Beach, "it's exactly as it says on the tin" beautiful.